The Ethiopian wolf, also known as the Simien fox, Abyssinian wolf, red fox, among others, is found in the Ethiopian mountains is a carnivore quite similar to the coyote in size. With more than half of its population located in the Bale Mountains of Ethiopia, it is Africa’s most endangered carnivore. Size: They have a head-body length of 2.76-3.31 ft (84-101 cm). Height: They stand at about 1.74-2.03 ft (53-62 cm). 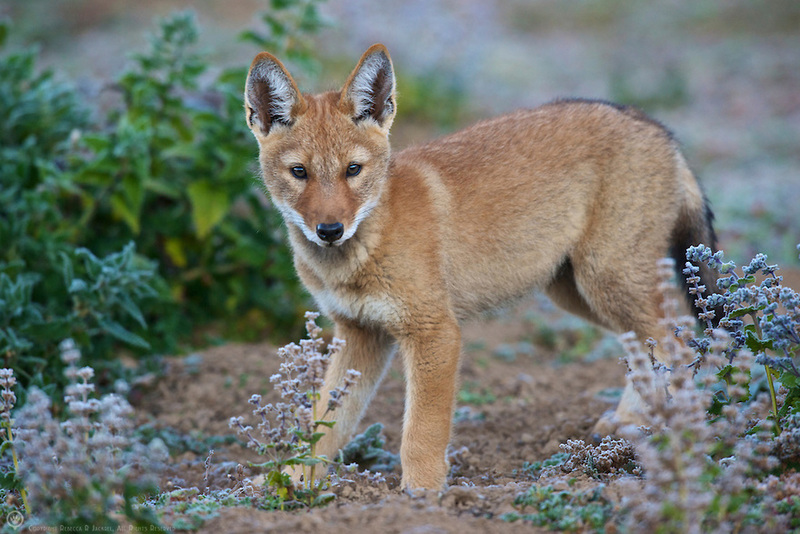 Weight: Ethiopian foxes weigh around 24.2-44 lbs (11-20 kg). Tail Length: Their tails reach a length of 10.7-15.8 in (27-40 cm). Color: They have a bright tawny red fur, whitish to ginger underfur, white undersides, chest, chin and insides of the ear, black tail and white eyes. Sexual Dimorphism: Males outsize females by around 20%. 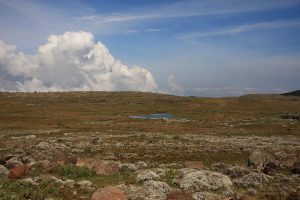 They live at altitudes of 9,840-14,435 ft (3,000-4,400 m) in afro-alpine grasslands and heathlands with vegetation less than a foot high. 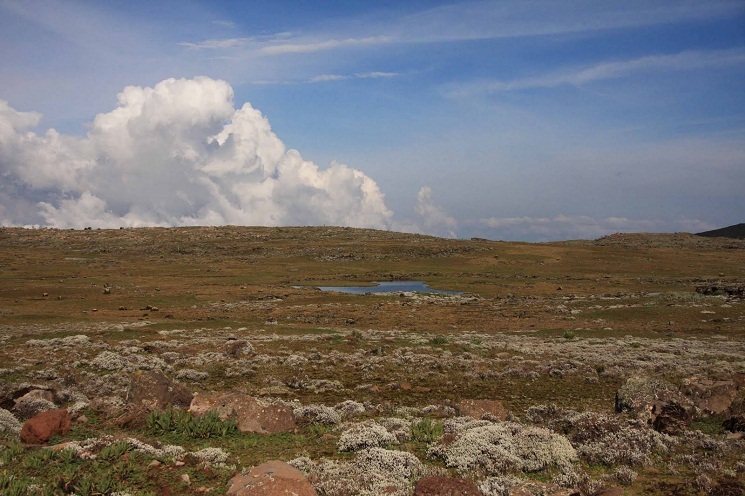 They are endemic to the mountains of Ethiopia. 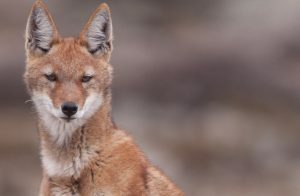 Ethiopian wolves are social animals, forming packs of up to 13 individuals, who get together for gatherings as well as patrolling in the early mornings, noon and evenings, However, they forage on their own for the remainder of the day. 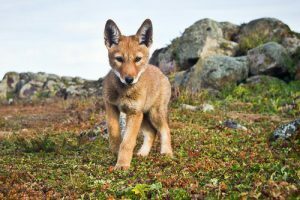 They are territorial outside of their packs and do not withstand the appearance of other packs or members thereof within their domain, which is around 2.3 sq. mi (6 sq. km) in area on average. They demarcate their home ranges by vocalizations and scent marking during their patrols, as well as interact in an aggressive and vocal way with members of different packs. 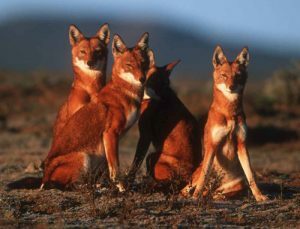 Females disperse off natal packs at sexual maturity, this is nature’s way of avoiding inbreeding between Ethiopian wolves. 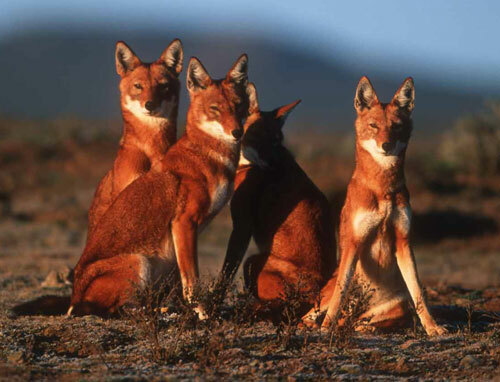 Copulation occurs only between the dominant male and female of a pack. The alpha male may even copulate with the subordinate female, though in such cases the resultant pups rarely survive. At estrus, the female gets more aggressiveness towards lesser members of her gender within the pack, while also increasing scent-marking, food-begging, and playfulness towards the dominant male. Mating takes place for around 3-5 days, between the months of August and November, with a gestation period lasting for around 2 months, after which 2-6 pups are born between October and January. Pups are born without vision and teeth, and the responsibility of caring for the babies is shared among all members of the pack. For the first 4 weeks of their lives, the pups are dependent on their mother’s milk as the primary food source, however, from the 5th week till up to around the 10th, they are slowly introduced to solid food which is regurgitated by members of the pack, in conjunction with the milk. Since the 10th week onward till around 6 months, young are weaned, and diet is shifted entirely to solid food provided by adult pack members. They reach sexual maturity at 2 years. Their life-expectancy in the wild is between 8-10 years. They are known to make a wide array of vocalizations. Alarm calls start with a ‘huff,’ followed by barks and yelps. They greet each other with growls to express a warning threat, and whines at high-frequency to show submission. They also partake in group yip-howls at pack reunions that one can hear from about a few miles away. Ethiopian wolves feed primarily on rodents, although they may collectively bring down and eat small antelopes, hares, and lambs. The thick underfur of the Ethiopian wolves gives them a layer of protection during the winter, helping them withstand temperatures as low as 5°F (-15°C). 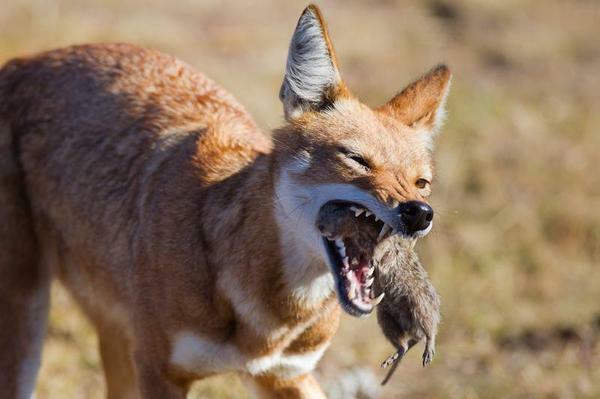 Their muzzle is narrow enough to help them dig into, the burrows of the small preys they hunt, as well as eat rodents. Their teeth are widely spaced to help them devour the prey with relative ease. They are at the top of the food chain of the ecosystem in the area they inhabit, thus having no predatory enemies in the wild. Widespread disease, especially rabies contracted from hybridization with domestic dogs. 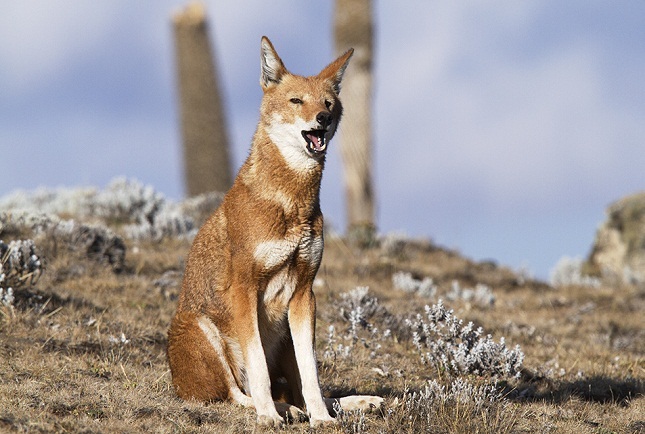 Habitat loss is another potent reason behind the Ethiopian wolf’s move towards extinction. A further danger to their numbers stems from the cause that the population itself is highly fragmented. 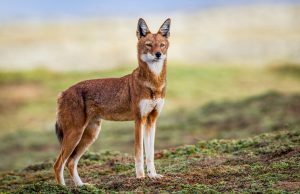 Stringent conservation efforts are now underway to curb the downfall of the Ethiopian wolves in their ecology, and a clear-cut action plan has been drawn. 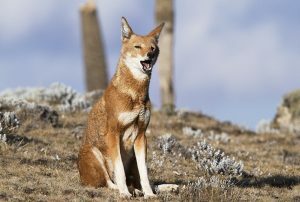 According to estimation, currently there are about 500 Ethiopian wolves left in the wild, and the population graph is on a decreasing trend. 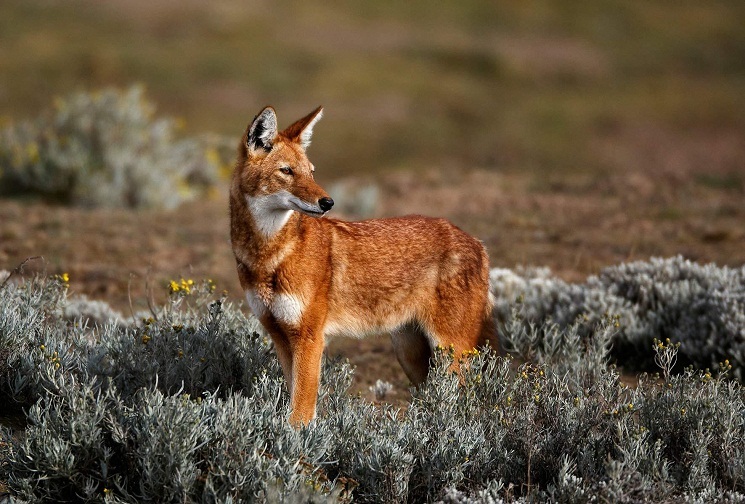 The Ethiopian wolf can run at speeds of up to 30 miles/hour. It is one of the few animals that form associations with different species ( especially geladas) to catch their prey.